This morning, I’d like us to consider the apple tree. The apple has a rotten reputation in church because it often represents the fruit that Adam and Eve ate in the Garden of Eden, which plunged the world into sin. However, the humble apple is not inherently evil. If anything, the apple ought to be held up as one of God’s many blessings to us. According to Wikipedia, there are some 7,500 known varieties of apples available, so you are bound to find a few that you like. There are so many varieties of apple because apples don’t take on the same characteristics as the apple whose seed produced the apple tree. The taste, smell, texture, color, etc. of an apple depends on the mixing of the genes of the mother tree’s flowers and father’s spores that pollinate. In other words, you could plant a Gala apple seed, but the apples might taste like a Granny Smith, Fuji, Honeycrisp or something else entirely. Because of this, apple growers have come to use a method called grafting. Grafting means cutting off a branch of one tree and connecting it into another. Today, apple growers will take a grafted branch that produces the kind of apple they want and connect it to the roots of an apple tree known to have roots resistant to bugs, diseases and cold temperatures. 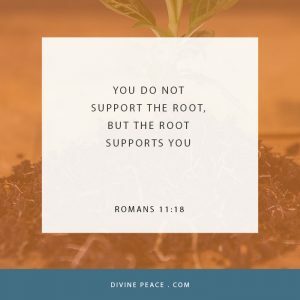 Apple growers know the value of having a solid root system to graft their branches into and the Apostle Paul makes the same point in our reading from Romans 11 that God connected you to the Root of life. Paul reminded the mixed group of Jewish and Gentile believers in Rome that God worked through the unbelief of the Jews to bring salvation. Paul called the death of Jesus a sin, which it was, as they put an innocent man to death. However, Paul went on to say that Jesus’ death brought salvation to the world, extending God’s grace beyond one nation to all nations. Paul said that God’s grace to make other people who were not descendants of Abraham, Isaac and Jacob his own people would make Israel envious. Out of envy then, some of the Jews who rejected Jesus would come back to faith in God. And Paul said, 12 …How much greater riches will their full inclusion bring! In other words, how gracious is God that those who had all the promises of God in the Scriptures, but lost faith and were against Jesus, might turn back to faith and once again be included as his people by faith in Jesus. Paul was understandably passionate to tell his fellow Jews that Jesus was their Savior, but Paul was also passionate to protect the Gentiles whom God had brought to faith. This is the first of two direct commands Paul gives in this section. Paul said that we are not to consider ourselves superior. We must remember that we were once growing wild; we were alive, but had no purpose, no connection to God, no good fruit and no hope for eternal life. However, God chose to cut us out of this wild world and graft us to the Root of life. We did not cut ourselves off the wild tree, hop along the ground and attach ourselves to the tree of life. Instead, it was God. The danger we face in thinking God picked us for being better than others is that we then take Jesus for granted. This happened to many at the time of Jesus and in our Gospel lesson from Luke 20, Jesus illustrated this temptation with a parable. He said that a man with a vineyard went on a trip and left his vineyard to be taken care of by tenants. When the harvest came, he sent his servant to collect some of his harvest, but the tenants mistreated the servant and sent him back with nothing. This happened two more times with increasing severity, then the owner sent his son, whom the tenants killed, thinking now they would be the ones to inherit the vineyard. However, Jesus ended the parable with the owner coming and killing the wicked tenants only to give the vineyard to others. The point is that we have been saved by God’s grace through Jesus, but what we have been given can be lost. If we grow so comfortable in the many blessings of God’s forgiveness, love, possessions, family, etc., then we might forget how truly lost we were in sin, how dangerous sin still is and how much we need God every day to keep us from falling away. If we grow comfortable with God’s grace, then we might grow comfortable with sin. And, if we are comfortable with sin, then we might not recognize our Lord when we stand at the entrance to his kingdom and our fruits won’t look like a bushel of good apples, but bad apples. It would be foolish for anyone one to believe that a branch on its own can support itself. A tree branch does not magically float above the ground, growing leaves and producing fruit. Instead, a branch is connected to the roots and that is where it gets its support for life. It would be foolish for us to believe we do not need Jesus. We need him to give us support and life. We need to be reassured that Jesus did live a perfect life for us, die for our sins and rise to give us the hope of eternal life. He supports our faith by sending the Holy Spirit to work through his Word. Through the Word of God, we are reminded to keep our eyes focused on the life waiting for us in heaven. Here Paul gives his second command in this section. We are not arrogant or filled with thoughts of superiority when reminded that Jesus is the root and source of our life. With faith in Jesus we are humbled and thankful at the power and love of God to save us through the sacrifice of his one and only Son. This faith also allows us to endure whatever frustrations, sicknesses, doubts or worries we have because we are not just looking for deliverance from the hardships of this life by God making everything right now, we are also looking forward to when God will make everything right for us in heaven. Isaiah told Israel to forget about the deliverance from Egypt, God was going to deliver Israel back from Babylon to Israel. And, more than either of these, God was going to bring them deliverance through the Savior. It was hard for Israel to trust in God’s future promises of deliverance, even though he proved himself in the past. You and I face the same struggle to trust in Jesus for our deliverance from sin and death when life gets in the way, but your future in heaven does not depend on the strength of your faith. Your future in heaven depends on the strength of your roots and your roots will stand firm forever because God connected you to the Root of life. Amen.